While growing up in the wilds of Essex, one of this reviewer’s prized possessions was a frame-by-frame picture book showing every scene of this 1942 classic, now reissued to celebrate its 70th anniversary. Many hours were spent scanning its glossy images, imitating Humphrey Bogart’s drawl and imagining ‘La Marseillaise’ drowning out ‘Die Wacht Am Rhein’ at Rick’s Café Américain. In the years that followed, many more were spent enjoying Michael Curtiz’s masterpiece on screens big and small – plenty of time to fall for Ingrid Bergman (as Bogart’s former lover Ilsa), warm to police chief Claude Rains and learn the lyrics to ‘As Time Goes By’. That Casablanca could still work its wonders on the page is surely a mark of its lasting brilliance, not to mention a tribute to an endlessly quotable script that has seen six of its lines included in the AFI’s greatest cinema quotes. Yet were you to come to this film blissfully oblivious to its landmark status, what would one find? Only a peerless example of Hollywood studio moviemaking, director Michael Curtiz turning the Warner backlot into a gloriously romantic vision of WW2-era Morocco crammed with real-life European exiles and larger-than-life character actors. Thanks to DoP Arthur Edeson it also succeeds as a quintessential noir, full of moody shadows, chiaroscuro and expressionist lighting. You’ll rarely see a finer use of flashback either, Rick’s (Bogart) drunken haze segueing into a Paris interlude that eventually comes to a close in a deluge of rain. And we haven’t even mentioned the clothes, Bogie’s trenchcoat and Bergman’s Trilby setting a template for ’40s glamour that will last forever. 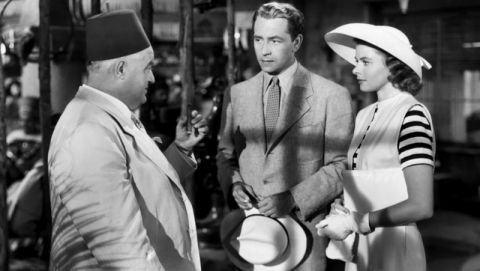 Whether you return to Casablanca for a nostalgia fix, a guilty pleasure or for the waters, you can be certain there’ll be something you didn’t notice last time out. Here’s looking at you, kid – again and again.